Modern Citroën Car breaker yard Bart Ebben sells high quality used Citroën car parts. Parts are shipped straight from a large warehouse to destinations worldwide. Send us a used car part request and let us contact you asap. Being a Citroën car breaker yard for over 35 years has brought us a large Citroën car part knowledge, which helps you to get the right part for your car. In all those years we have been building a solid stock containing car parts for C1, C2, C3, C4, C5, C6, C8, DS3, DS4, DS5 and the Picasso modells and the AX, Saxo, ZX, Xsara, Xantia or XM as well. 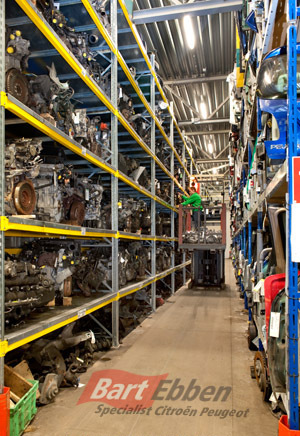 You can even find second hand Citroen car parts for the Citroën Nemo, Berlingo, Jumpy - Dispatch en Jumper - Relay vans. As a modern Citroen car breaker yard we are a reliable supplier for second hand Citroen car parts with a continously growing know-how. This becomes your benefit when it comes to selecting the right spare part for your car. So feel free to ask our salesteam and let us help you in finding the right used car part for your Citroen model. We are always willing to help you make a proper choice from our wide range of parts like an engine, gearbox, ECU computer, Airbag, steering pump, steering rack, exhaust manifold, radiator, window mechanism, door, bonnet, head light, bumper, engine oil sump, cilinderhead, indicator switch, etc. Selecting the right part yourself is made easy in our car parts catalogue. We ship second hand Citroen breaker yard car parts worldwide every day, the salesmen form our car breaker yard have excellent technical knowledge making ordering the right auto parts very simple. You can rely on proper packaging and experienced, automotive shipping companies. We do everything within our possibilities to get the parts to your location in a dependable way and within a reasonable time. Looking for a Peugeot car breaker yard? You have come to the right place as well!